TransAM NF?B Kits are DNA-binding ELISAs that provide everything needed to study Nuclear Factor ?B (NFkB), including a positive control extract. Kits are available with antibodies specific for the activated form of p50, p52 and p65. A family kit is also available with the ability to screen the members of the NFkB family (p50, p52, p65, c-Rel and RelB). Recombinant p50 and Recombinant p65 proteins are available separately to generate an optional protein standard curve in the TransAM NF?B Transcription Factor ELISA kits. The TransAM® Method tab below provides complete method details; the NFkB Info tab gives an overview of the NF?B transcription factor as well as kit data; the kit manual can be downloaded under the Documents tab. NF?B family profiling of DNA binding activation in various cell lines. Nuclear extracts prepared from HeLa, HeLa treated with TNF-?, Jurkat, Jurkat treated with PMA and calcium ionophore, and Raji cells were assayed at 10 µg/well for p65, p50, c-Rel, p52 and RelB activity using the TransAM NF?B Family Kit. * Technology covered under EAT-filed patents and licensed to Active Motif. Use of TransAM in NF?B-related drug discovery may be covered under U.S. Patent No. 6,150,090 and require a license from Ariad Pharmaceuticals (Cambridge, MA, USA). Historically, transcription factor studies have been conducted using gelshift, Western blot and reporter plasmid transfections, which are time-consuming, do not allow for high-throughput and provide only semi-quantitative results. TransAM assays are up to 100 times more sensitive than gelshift techniques, and can be completed in less than 5 hours. Because TransAM is an ELISA-based assay*, there is no radioactivity, and the high-throughput stripwell format enables simultaneous screening of 1-96 samples. Inconsistencies due to variable reporter plasmid transfections are eliminated, along with the need to construct stable cell lines. 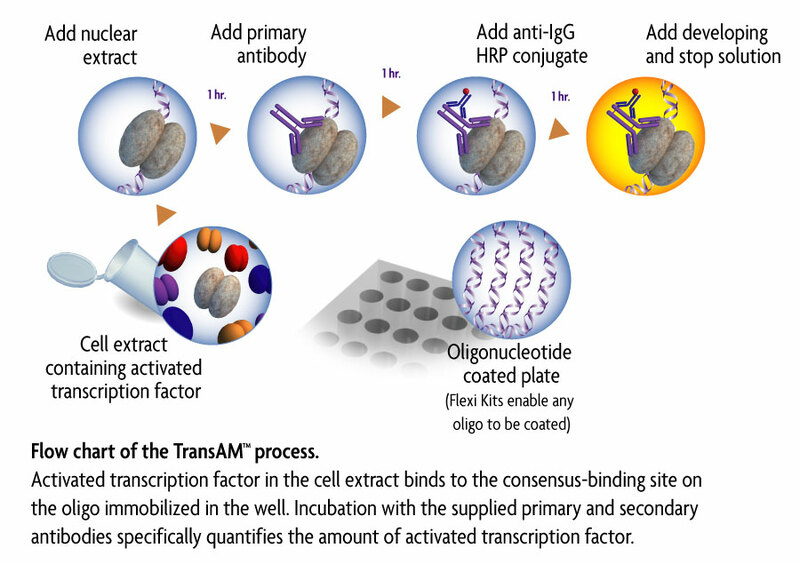 Why use TransAM® transcription factor ELISAs? The TransAM format is perfect for assaying transcription factor binding to a consensus-binding site. TransAM Kits contain a 96-stripwell plate to which the consensus-binding site oligo has been immobilized. Activated nuclear extract is added to each well and the transcription factor of interest binds specifically to this bound oligonucleotide. A primary antibody specific for an epitope on the bound and active form of the transcription factor is then added followed by subsequent incubation with secondary antibody and Developing Solution to provide an easily quantified, sensitive colorimetric readout (Figure 1). Figure 1: Flow chart of the TransAM process. Activated transcription factor in the cell extract binds to the consensus-binding site on the oligo immobilized in the well. Incubation with the supplied primary and secondary antibodies specifically quantifies the amount of activated transcription factor. Figure 2: TransAM NF?B is more sensitive than gelshift. Human fibroblast WI-38 cells are stimulated with IL-1? for 30 minutes. Increasing amounts of whole-cell extract are assayed using the TransAM NF?B p50 Kit (A) or gel retardation (B). One, two or five NF?B 96-well assay plate(s) with plate sealer(s), NF?B p50, p52 or p65 or p50, p52, p65, c-Rel and RelB primary antibody(ies), HRP-conjugated secondary antibody, NF?B wild-type and mutated oligonucleotides, positive control cell extract, DTT, Protease Inhibitor Cocktail, Herring Sperm DNA, Lysis, Binding, 10X Washing and 10X Antibody Binding Buffers, and Developing & Stop Solutions. Reagent storage conditions vary from room temperature to -80°C, see manual for details. All reagents are guaranteed stable for 6 months when stored properly. NOTE: the p50 and p52 antibodies can be used with human and mouse extracts, while the p65 and RelB antibodies can be used with human, mouse and rat extracts. The c-Rel antibody can only be used with human extracts.